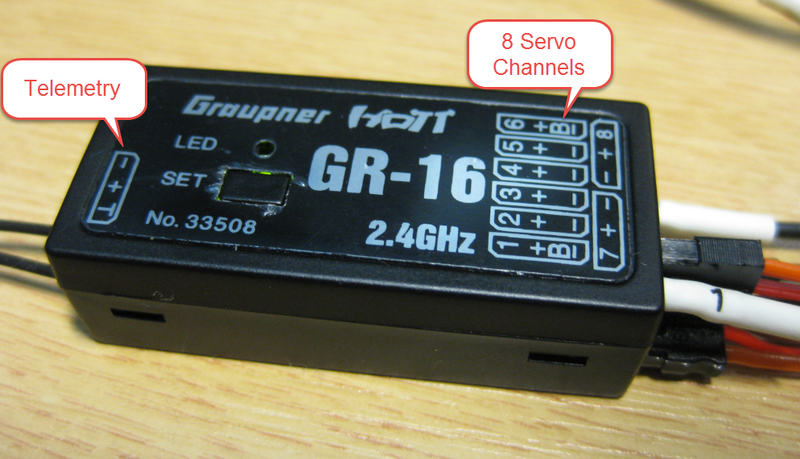 The GR-16 has one telemetry/programming port and can drive up to 8 servo channels. So it would be possible to connect directly the 4 ESC’s of the quadrocopter to the four first channels, but then I would not have any gyro stabilization. Instead, I want the Freescale FRDM-K22F read the servo signals and drive the ESC’s with the Kinetis K22F with the help of the sensors. So I would like to use a ‘standard’ remote controller with a ‘standard’ receiver, but read the receiver signal with a microcontroller and drive the motors with the microcontroller. But 50 Hz is rather slow for a dynamic system like a quadrocopter. Additionally it would mean that I need to sample/read at least four such signals which would be doable, but painful. 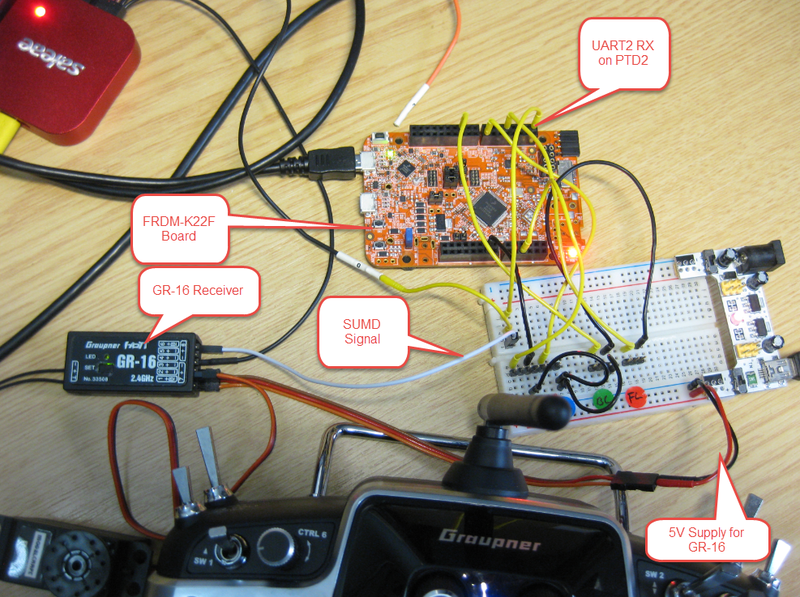 Flight controllers need a better way of getting input signals, and for this several analog and signal bus system exist, for example Futaba SBUS or the Graupner SUMD. 💡 I would have expected that 0x81 is sent when the receive is in safe mode (see later below). But in my findings the 0x81 is only sent if the transceiver is powered up with no receiver signal present. Otherwise it sends 0x01 even if he lost the radio signal. This does not make sense to me? The data packets are between 0x1c20 (-150%, 900 μs, extended low position) up to 0x41a0 (+150%, 2100 μs) for extended high position. 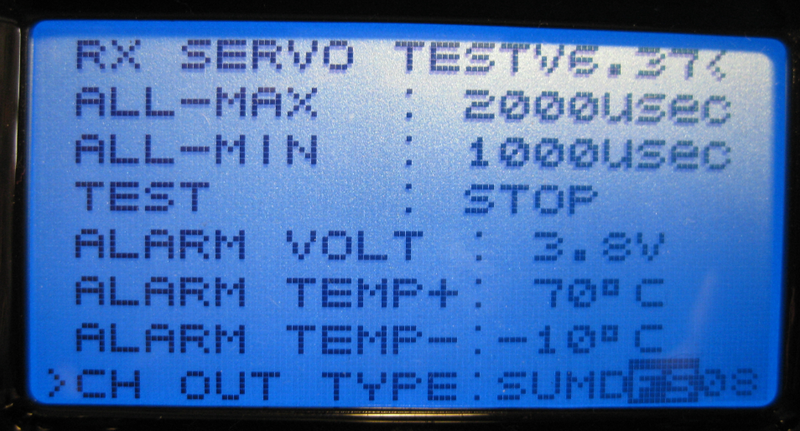 ONCE: the receiver outputs are transmitted in sequence: recommended for analogue servos. This setting ensures that the servos are automatically operated using a 20 msec cycle – 30 msec in the case of the twelve-channel receiver (Order No. 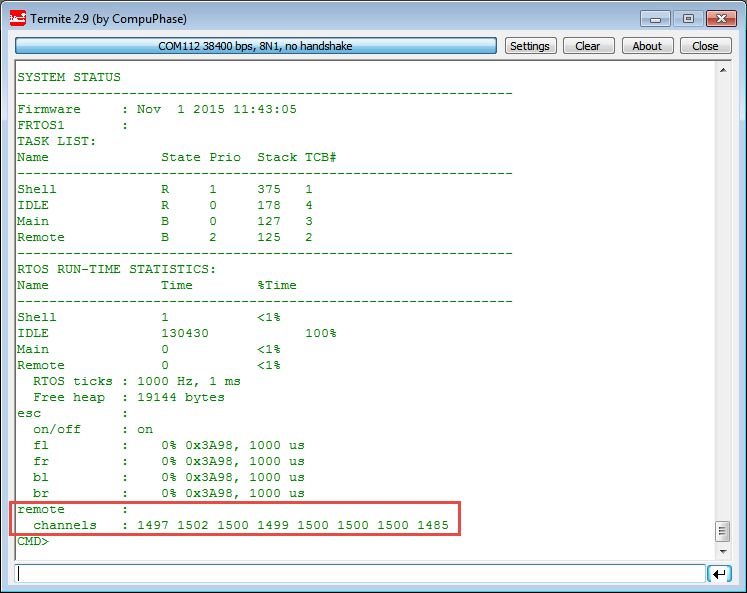 33512) – regardless of the value set and displayed in the RX SERVO display under the menu point ‘PERIOD’. 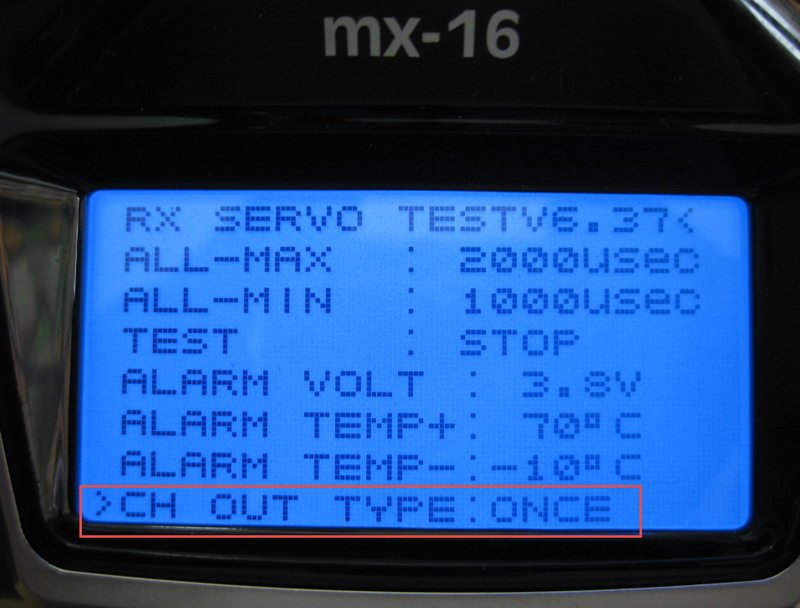 must set 20 ms in the menu point ‘PERIOD’ in the RX SERVO display. Note: if you select the SAME setting, it is especially important to install a high-capacity receiver power supply system, as up to four servos are almost always working simultaneously, placing a greater load on the battery. SUMI: (Sum signal Input): Input for satellite receiver. 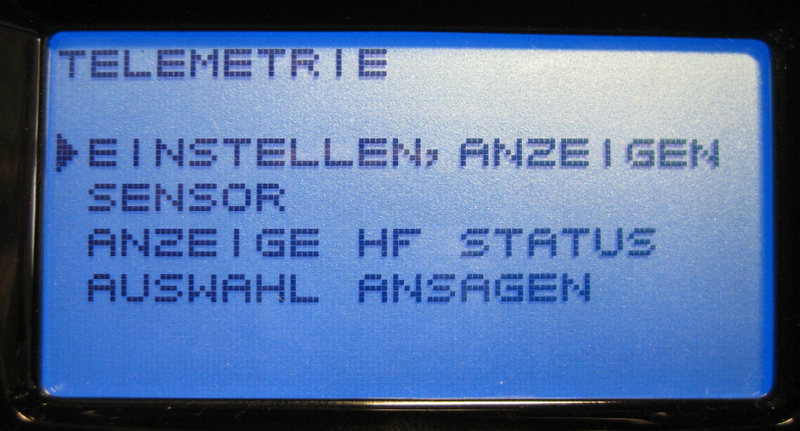 With that mode it is possible to have a ‘satellite’ receiver for redundancy, see http://fluggeil.de/articles.php?article_id=116 (in German). SUMD: (Sum digital out) Produces a digital sum signal which can be read in e.g. by a microcontroller. The sum signal has all the servo signals in one data packet, so I only need to read that signal. 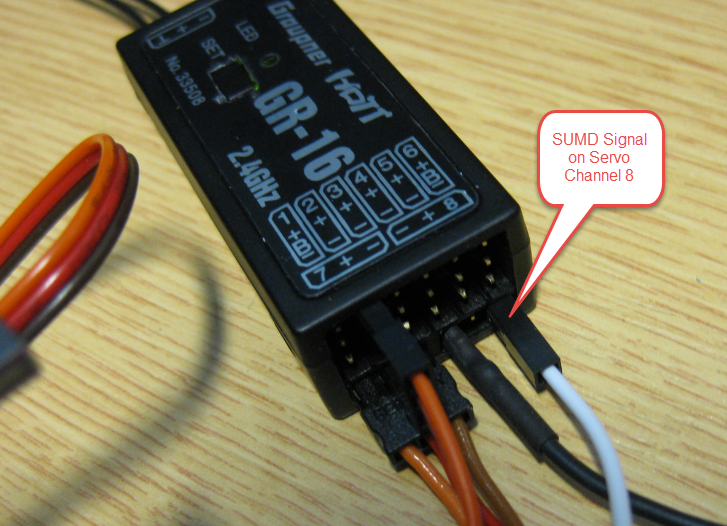 The SUMD signal is always issued on servo channel 8 on the GR-16, and that channel might be different for each receiver. In SUMD mode, I can configure a failsafe type and the number of channels. 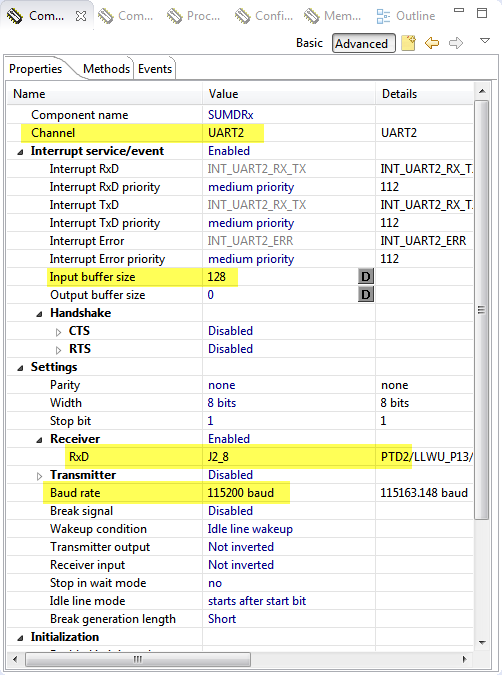 With the failsafe mode I can specify what shall happen in case the receiver does not receive a signal. SUMD OF (Failsafe OFF): No signal is emitted in case of communication loss. SUMD FS (Failsafe POSITION): In case of communication loss, the preconfigured failsafe servo positions are sent. 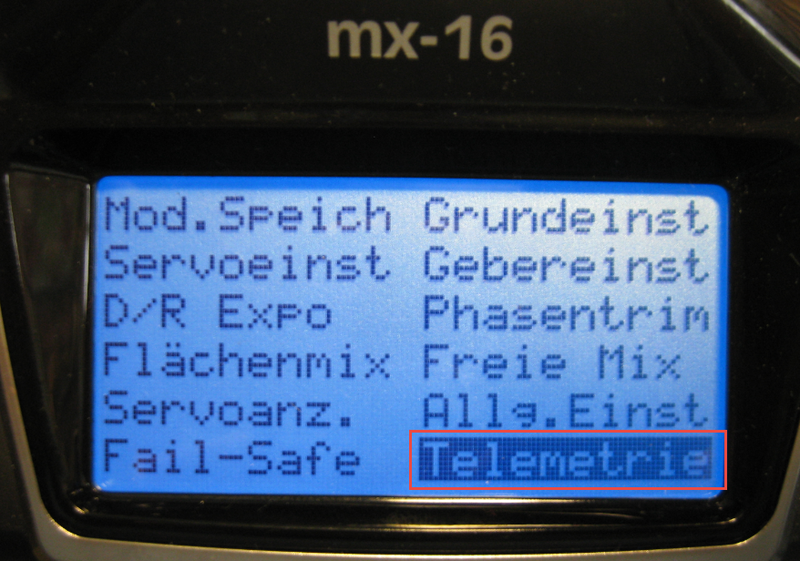 For example I can configure ‘safe’ servo settings and if the receiver goes out of range, it will default to the safe settings. SUMD HD (Failsafe HOLD): In this mode, the receiver will continue to emit the last received values. The SUMD decoder I’m using is taken from the PX4 PixHawk Autopilot project (https://pixhawk.ethz.ch/docs/sumd_8c.html). 💡 The original PX4 SUMD implementation did not handle the 0x81 failsafe byte. I have extended the implementation to cover this case. 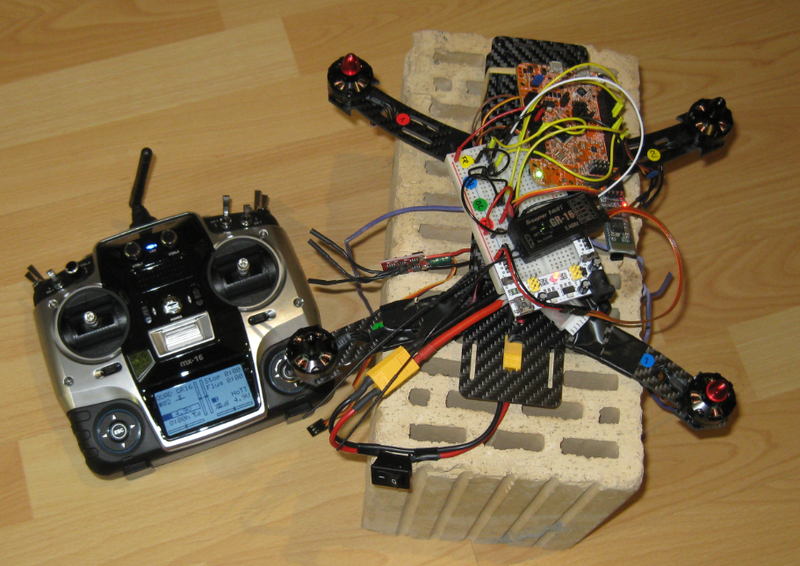 And here is my rough test setup: The quadrocopter (FRDM-K22F board, motors and receiver) is powered by the battery. The remote controller is used to affect the speed of the motor(s). I have now the ability to use a normal RC control unit with a receiver to send signals to the microcontroller. 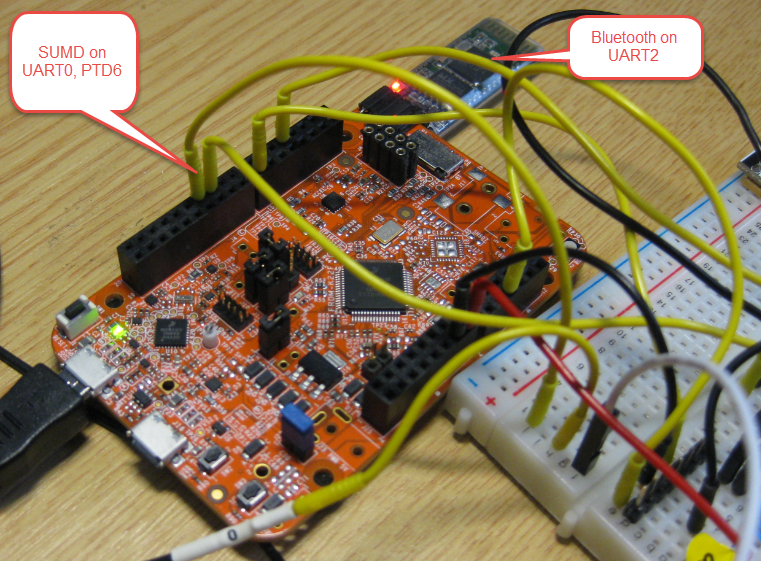 Using the SUMD signal I can use a UART to read in the sum signal and then process it be the microcontroller. That way I have a handy way either to control my quadrocopter, or any robot or any kind of things for which I want to have a remote controller :-). 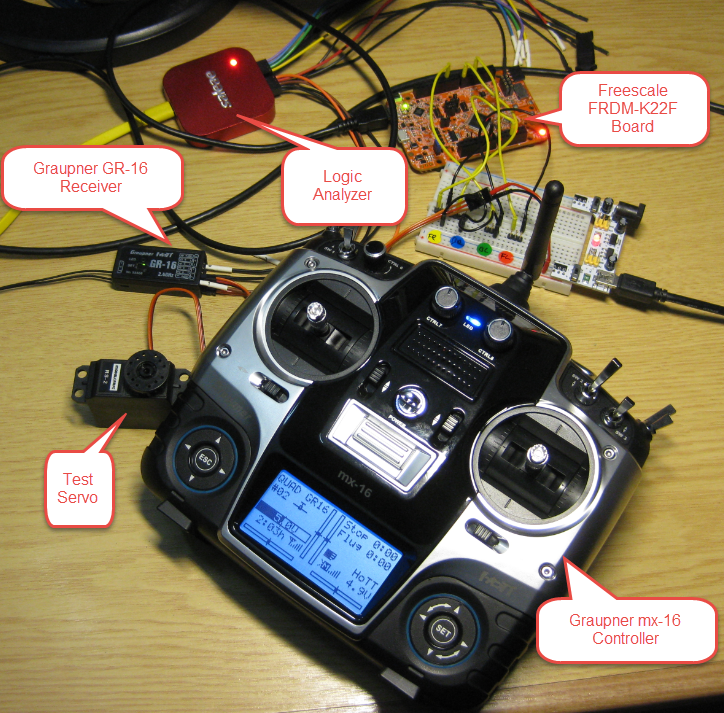 This entry was posted in ARM, Boards, CPU's, Eclipse, Embedded, Freescale, Graupner Alpha 250Q, KDS, Kinetis, Quadrocopter, Robots, Tips & Tricks and tagged Building, FRDM-K22F, freedom board, Freescale, open source projects, software project, technology, Tips&Tricks by Erich Styger. Bookmark the permalink. Drones are one of the hottest items of the year. You see them getting into trouble on the news, getting Cartman into trouble on South Park, but most importantly, you’ve been seeing a lot of stunning videos and photos captured by a drone. Drones have piqued the imagination of creatives all over the world, making aerial photography and videography more cost effective than ever. And if you’re reading this, there’s a good chance you want to get your feet wet as well.